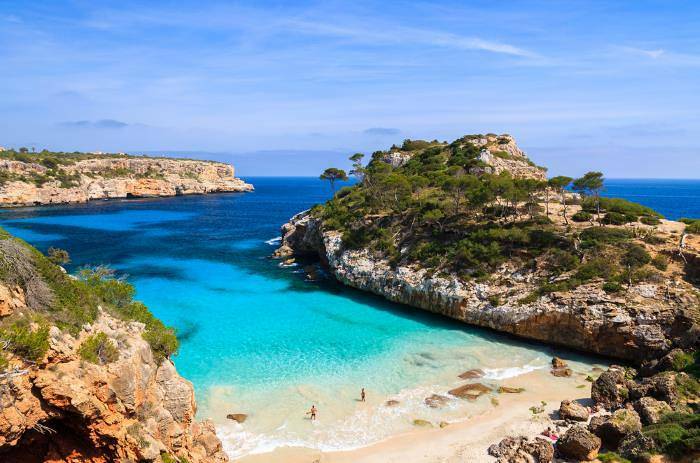 Search for pictures of Majorca’s beaches and your eyes will be treated to dazzling images like this, with sparkling crystal seas, pale gold sands and barely a tourist in site. But where are these exquisite coves to be found? We’ve investigated and here are the whats, wheres and hows of visiting these divine beaches. The whys should be pretty obvious. This unspoilt gem of a beach is located in a pine forest midway between the eastern towns of Porto Colom and Porto Cristo. After a short walk through the shaded pines you’ll emerge on a postcard-worthy bay with shallow aquamarine waters and fine white sand. There are no facilities here, so come prepared, and you’ll want to remember to bring your snorkel. If you’re feeling adventurous there’s a cave system to explore here too. Visiting guide: This one is definitely off the beaten path. If you stay at Calas de Mallorca you’ll have a pretty easy 10-kilometre drive. You’ll need to park up and walk 15 minutes through the forest to reach it. The reward is a stunning beach that you could possibly have all to yourself! The biggest resort in the south-east is one of Majorca’s most laid back. 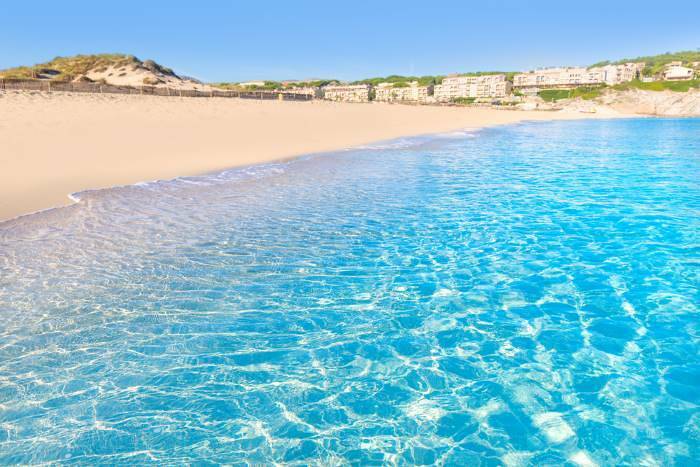 There are five beautiful beaches in the resort, however as the largest, Cala Gran, is still only 40 metres long, they can get busy in the height of summer. Still, never mind – you’re in a great position to explore some of the other beaches listed below! Visiting guide: Package holidays exist to Cala d’Or, or you can book flights and a hotel seperately. 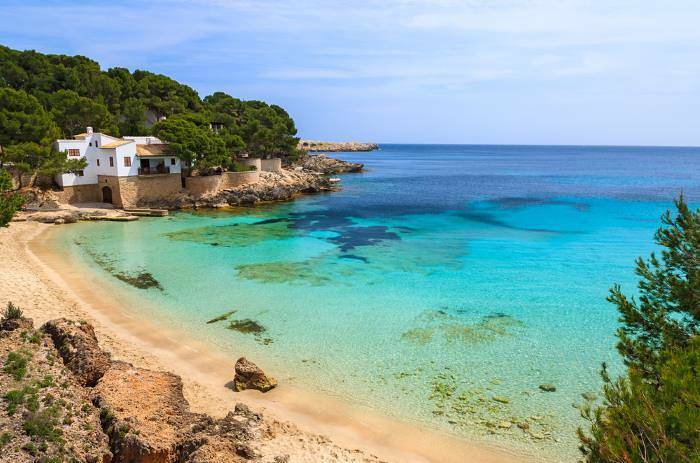 This is the quintessential idyllic Majorca cove: sugar-white sands fade into neon turquoise waters, and encased by rocky cliffs frosted with green vegetation. Because it has graced so many postcards of Majorca it can get crowded, as tourists come to see the scene for themselves. Come early to stake your claim to a beach-towel’s worth of sand, and be prepared for a bit of a trek to get here. 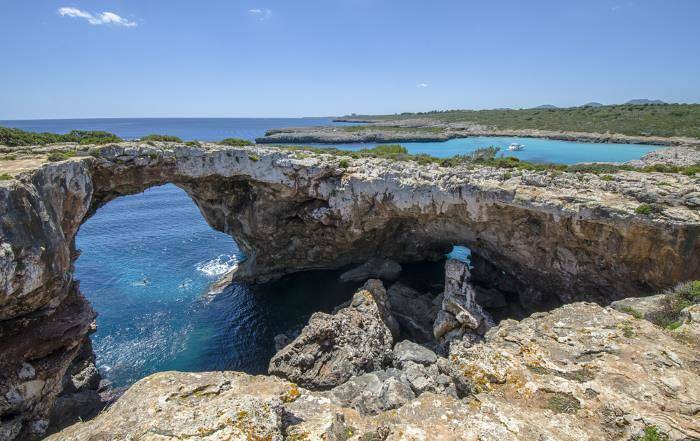 Visiting guide: Reaching Caló des Moro involves a 400-metre walk down a narrow, steep trail. And you will definitely need a car to reach that. 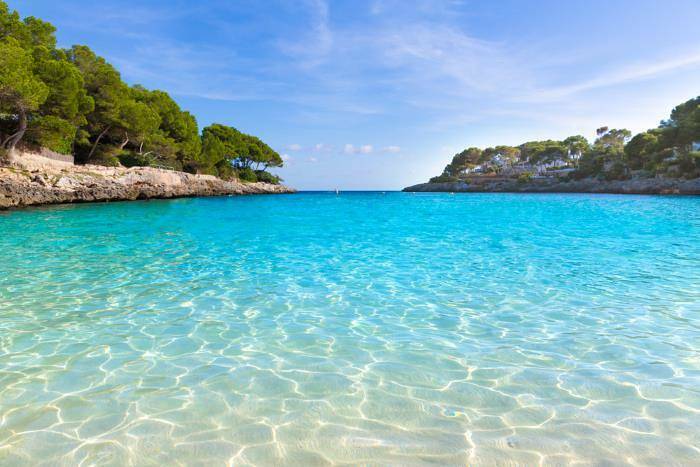 That means you can visit this beautiful beach from anywhere on the island, but Cala d’Or is the nearest big resort. Despite being just the other side of the same town as Caló des Moro, this idyllic inlet is relatively unknown by Majorca’s standards. The beach isn’t long, but it does extend quite far inland, and whilst it’s not got lots of facilities there, in summer you’ll find a tropical beach bar selling fresh fish and cold beer. What more could you want? Visiting guide: This southern corner of Majorca is somewhat off the package holiday map. You can search for villas in the surrounding area, or stay at Cala d’Or which is a reasonably close half an hour’s drive away. You will need a car (or book a taxi) to reach this beach. Though this small and sheltered bay on the south-west coast is a purpose built resort, it’s a hidden and exclusive one. So exclusive in fact that A-list names of the level of Claudia Schiffer and Tom Cruise are known to have bought property in the area. The emerald sea is incredibly inviting. You can even dine surrounded by it on all sides at La Illeta restaurant, reached by a footbridge out to sea. Visiting guide: You can find plenty of hotels and holiday deals for Camp de Mar. 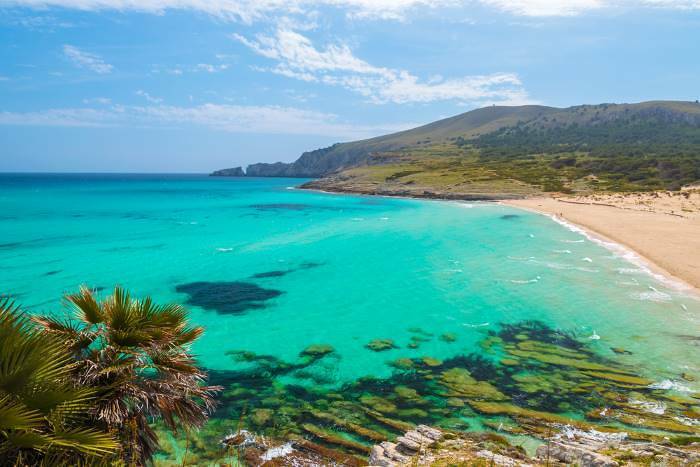 Although your eyes will naturally be drawn to the barely believable turquoise water at Cala Mesquida, if you cast a glance further afield you’ll note green hills, rolling sand dunes and pine forests. This part of Majorca is a protected bird sanctuary, so it’s a wonderfully undeveloped bay, surrounded only by Majorca’s natural beauty. Cala Medquida is located at the very north of Majorca, making it more exposed than other beaches, and it can be windy. This does make it a popular spot with wind and kite surfing enthusiasts however. Visiting guide: There is a smattering of hotels and shops at Cala Mesquida, but you’ll find more options at Cala Ratjada, a traditional resort which is about five kilometres south. If you want to make a trip from elsewhere in Majorca, a car is advised. Cala Mesquida is about an hour and a half north of Majorca Airport. By public transport it’s considerably longer. 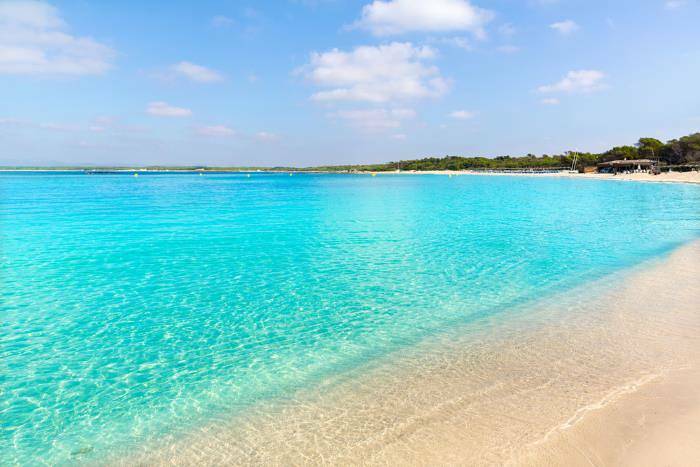 Quite possibly this is the most famous beach in Majorca – its claim to fame is that it looks more likely to be set somewhere in the Caribbean than the Med. Though its fame does draw in the crowds, Es Trenc is miles from the nearest resort, which retains its wild and unspoilt charm. 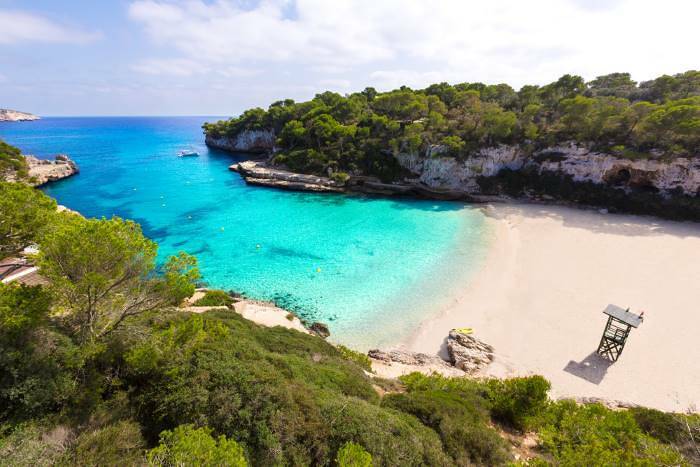 Also, with two kilometres of sand, you can walk along the shore to find your own private peaceful spot – though be aware that this is also one of Majorca’s official nudist beaches. You can reach Es Trenc by car or public transport. The entrance by the village of Ses Covetes has cheaper parking, and there are facilities if you want to stock up for the beach. If you want to stay nearby there are some hotels at the small resort of Colonia St Jordi. Everywhere else is a bit of a drive away – but it’s worth it. This picturesque bay is encased by cliffs and trees to both sides, which shelter it even on windy days. The crystal clear sea is wonderful for snorkelling, with all sorts of colourful fish flitting around the cliff borders. This area of Majorca isn’t well known in the UK but German tourists have already caught onto its charms, so get to the beach early if you want one of the sunloungers. Visiting guide: Cala Gat is walk-able from the harbour resort of Cala Ratjada. 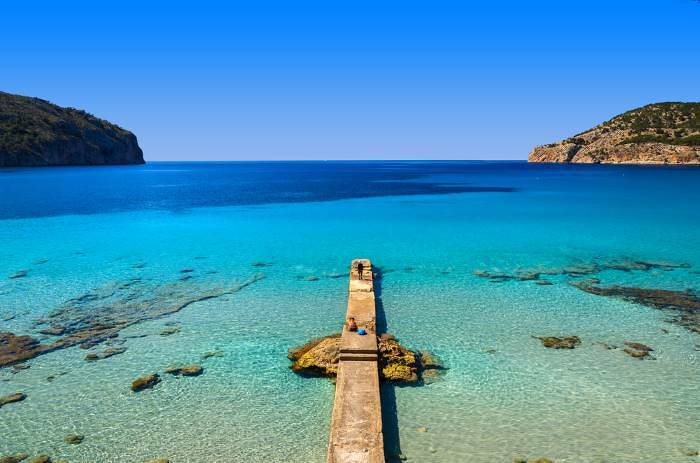 There are plenty more amazing Majorcan coves waiting to be discovered.